Spike TV announced today that they will continue their giving ways by offering a “UFC Prelims” special for “UFC 115: Liddell vs. Franklin” on June 12th. The edgy network confirmed that the lead-in show will feature two lightweight bouts; Tyson Griffin’s pivotal scrap with Evan Dunham and Mac Danzig’s fight against Matt Wiman. 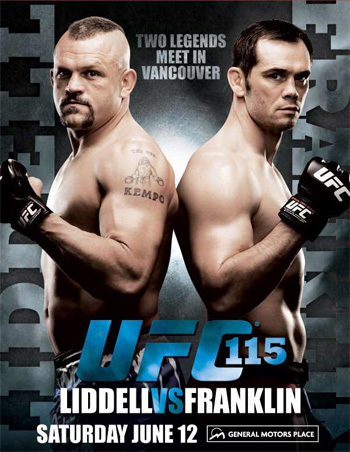 UFC 115 takes place inside GM Place in Vancouver, British Columbia, Canada. The freebie special airs at 9PM ET/6PM PT and will serve as a teaser to the night’s pay-per-view broadcast. The UFC first offered the teaser for UFC 103 in September to help promote the struggling fight card, and the special proved to be an effective means of generating last-minute PPV buys.